What Kind Of Life Insurance Do I Need? Life Insurance Rating Classes How Do They Work? Rogue health insurance websites are set up to capture personal information from people trying to get instant quotes, and then the websites sell that information to agents. In the results from 2 Google searches for “Pregnancy Health Insurance” and “Maternity Insurance Plans,” almost 50% of the top 20 results were rogue websites. There are plenty of legitimate health insurance websites to choose from, but you need to be able to distinguish the good from the bad. By hitting the “Get Quote” button on lead capture websites, you tell them, “Please have 5-10 medical insurance agents call me for the next 8 weeks trying to sell me a policy”, and “Please sell my email address to other list services and health insurance agents so I can receive their unwanted emails”. I’ll show how you can recognize these websites before they deceive you. About 10 years ago, I left the corporate world to start my own business. I needed to set up health insurance for my family so I went online and searched for San Diego Medical Insurance. I figured the top links should be the best ones to visit so I did. I read a little bit of information on the first website, and it said I would receive instant San Diego health insurance quotes by filling out the website’s quote request form, so I filled out the form. When I hit the “Get Quote” button I was sent to a page that told me I would be contacted by 5-8 agents that would provide me with quotes. About 20 seconds later my phone started ringing, and for the next 2 months I received daily phone calls from agents wanting to sell me health insurance. The email barrage was even worse because I don’t think it ever stopped. I eventually had to get a new email address (this was before spam filtering). The website has Google Ads for insurance – No legitimate California health insurance broker would allow ads for competitive websites to be displayed. The website has a link for “Agents” or “Brokers” (scan through all the navigation links including the ones on the top and bottom of the page) – This typically means the site is going to sell your information to the agents/brokers that sign up to use the website’s service. In California, check to see that the website has an insurance license number (many times this is placed at the bottom of the page) – if not it could be a rogue website or a national company that might not know the specific details of the California health insurance market. Look for something similar to the following wording “this website provides a free service and is not an insurer or agent/broker” – this means it is a marketing website that will sell your information to agents or refer you to a national broker for a referral commission (affiliates). If you don’t see any of the above red flags, you can enter your zip code and push the button to get a health insurance quote, but you still need to look out for 3 more red flags on the quote entry page. Check the Disclaimer or Terms & Conditions link at the bottom of the quote request page to see if the website is going to have agents call you. If the quote request form requires your home address – This is not necessary to provide you with an online quote, and will result in you getting junk in your mail box. If the form asks for the best time to contact you – this definitely means agents will be calling you. 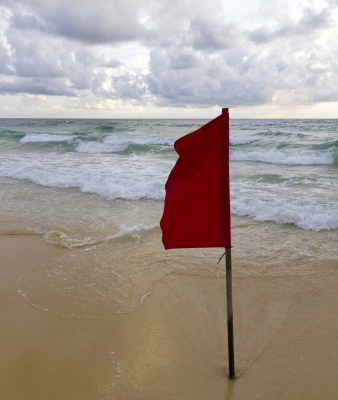 If one of the above 3 red flags occurs you should close that page. As long as you don’t hit the final “Submit” button on the request page, your information should not be saved. Rogue lead capture health insurance websites are pretty common on the internet, and tend to show up in longer keyword searches. To avoid becoming a phone and email spam victim you need to be careful to ensure you are working with a legitimate San Diego Medical Insurance website. Signs to look for are websites that have Google Insurance Ads, Agent/Broker links, no insurance license, bad privacy policies, or text that says the website is not an insurer or a broker. Following these simple precautions will make your online search stress free. Since you are already here at SPF Insurance, go ahead and run a comparison quote now by clicking on this Health Insurance Quote link. Your information will be protected and not sold or given to any other company. Previous Post: Maternity Health Insurance Plans Anayzed: What Are Your Out Of Pocket Costs Going to Look Like? Next Post: PCIP California (Pre-Existing Condition Insurance Plan) Rates Just Cut! I am really impressed with your writing skills as well as with the layout on your blog. Is this a paid theme or did you modify it yourself? Either way keep up the excellent quality writing, it’s rare to see a nice blog like this one these days.. Thanks for the compliment. The blog template is paid wordpress theme with some tweaks I put in. I look forward to having you back again. Greeeeeeeeat Blog Love the Information you have provided me. What Are Qualifying Events For Health Insurance? What Is The Health Net MedXM In-Home Wellness Service? Should You Use It? When Will My 1095 Form Arrive For My Tax Returns? The content from this webpage cannot be published on any site without the written approval of SPF Insurance Services.